Cassidy Kincaide owns Trifles & Folly, an antique/curio store and high-end pawn shop in Charleston, South Carolina that is more than what it seems. Dangerous magical and supernatural items sometimes find their way into mortal hands or onto the market, and Cassidy is part of a shadowy Alliance of mortals and mages whose job it is to take those deadly curiosities out of circulation. Urban Fantasy (UF) is a tough genre to break into these days, with everyone and their cat trying to write the next Mercy Thompson or Kate Daniels series. It’s also a tough genre for me to review, because it’s my favourite and I’ve read so many of them. 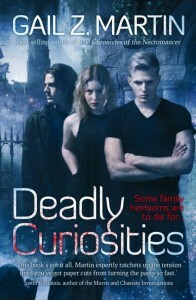 I felt a bit out of my element with Deadly Curiosities, my first Gail Z. Martin novel – I know that she’s written several high fantasy series, but this is her first foray into the wonderful world of UF. Overall, I thought this was a very good first effort and liked it, but I had a few minor reservations. Deadly Curiosities got off to a rocky start. The very first paragraph was a massive info-dump and the writing was horribly awkward. I started to wonder if maybe I had been confused, and this was Gail Z. Martin’s debut novel after all. Almost the entire back story for two major characters is dumped within the first chapter. Things were not looking good. But suddenly Martin seemed to get her mojo back and we got the beginnings of a real story. Cassidy Kincaide is a Charleston girl, born and raised. Her family’s long history in the historic town enables her to hob-knob with the upper crusts, a valuable asset when you’re in the antiques business. Martin portrays this business aspect of Cassidy’s life with admirable realism: there are the periods of cheerful busyness, those overwhelming afternoon rushes, and even the occasional bleak moment when it seems that Cassidy won’t have a single customer all day. Even on these slower business days, Cassidy and her assistant/BFF Teag aren’t bored – they have plenty to occupy their time, as Trifles and Folly is also a front for a kind of magical bounty-hunting organization. Teag and Cassidy are assisted by Sorren, a vampire and Cassidy’s silent partner. He is sufficiently mysterious and mildly tortured, but otherwise Martin steers him away from tired vampire clichés. The team combines their considerable powers to track down antiques that carry a potent magical charge, benign or otherwise. These objects are identified through Cassidy’s gift of psychometry, which allows her to read an object’s energy and memories associated with it through touch. Teag’s magical gift is much more interesting: he has Weaver magic, which allows him to manipulate and control anything with a web-like structure, including the internet. Guys, he’s basically a magical hacker. How cool is that?! Coolness factor aside, the gang’s abilities take their toll whenever they’re used against a baddy, which I really appreciated. I think that it’s also worth mentioning that Teag is gay, and has an established relationship with his partner Anthony. They were adorable and had a very mature and loving relationship. None of the characters batted an eyelash at their sexuality, which I really appreciated. Always nice to see a well-developed gay couple with a supportive group of friends and colleagues. It’s been a while since I read an UF that revolved around what is essentially a ghost story. The history major in me was delighted to see that many of the spirits in Deadly Curiosities were from the nineteenth century. Several minor characters who worked in archives and museums assisted the team in their investigation by relating popular urban legends from that period. I had no idea that Charleston is actually considered one of the most haunted cities in America! It’s definitely become a more interesting travel destination for me. UF set in the South seems to be growing in popularity, but this is the first time I’ve read about Charleston. Like all the great UF series, Deadly Curiosities benefits from a very strong sense of place and vibrant culture. The inclusion of several characters who are practitioners of Voudoun (or Voodoo) was a welcome addition, and helped this first installment from feeling too white-washed. There is no established romantic relationship, potential lover, or sexual tension of any kind for Cassidy. In my experience this is very unusual in UF, but I didn’t find it off-putting. I was a bit wary of a Sorren/Cassidy pairing, but thankfully that was unwarranted. 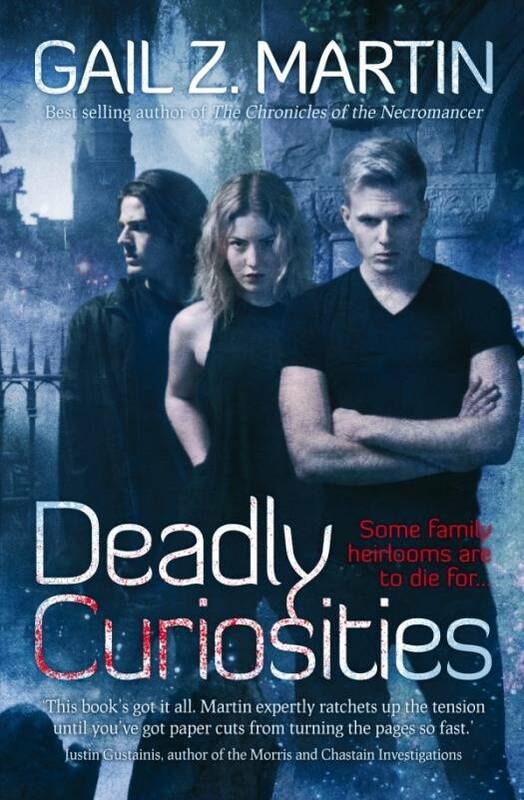 If you need a break from romance but want a spooky, ghost-y UF, Deadly Curiosities is a good bet. I wanted to drop everything and move to Charlston while reading this. 😀 I LOVED her portrayal of the city, she gave the place more life and atmosphere than so many UF books I’ve read. I agree, I think she had some issues with pacing but on the whole I really enjoyed this. I think I might even prefer her UF over her high fantasy. Me too! The neighborhood where Trifles & Folly was located just seemed so cool and all the other business owners were so friendly. I’d be all over one of those haunted carriage rides! Pacing issues aside, I’m looking forward to the second volume a lot. OK, I was curious about this, but I seem to be hard to please with UF. Hearing that there is no romance in this actually makes me more interested. I hear ya. It gives the series somewhere to go, in my opinion. Sometimes I just cannot take the 7 book sexual tension build-up. This book was a breath of fresh air in that regard. I like the sound of a break from romance. I haven’t read any of this author’s fantasy stuff either. I know Maggie my coblogger just read it and she said that she enjoyed it but seemed to share some of your qualms. It is hard to break into the UF genre and make a good splash hopefully the next one will be stronger. It seems like many UF series improve as they progress, and I look forward to seeing if this one fits the pattern. Here’s hoping! I definitely agree many of them do start off ‘ok’ or weaker and then get to be very solid as the author finds their legs in the world and characters.